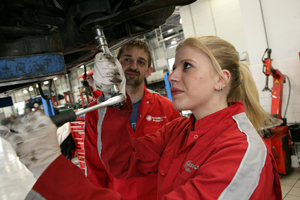 More than 100 apprentices have passed The Parts Alliance Servicesure Autocentres Programme since its inception in 2007. 113 apprentices completed 24 weeks of training over 36 months to gain their qualifications as light vehicle technicians. The Servicesure Autocentres Apprenticeship Programme is run in partnership with ProVQ Ltd, who delivers the Government backed scheme at its training centre in Shropshire. Julian Lloyd, Managing Director of ProVQ, said that he has noticed a rise in the number and quality of the young people applying to be part of the programme. “It is a different approach, a broad holistic education approach, which works,’ he added. “It is more than a technical training programme; the apprentices learn life skills and team building too. The end result is a well-rounded individual with skills for the workplace and the ability to develop their own skills.